I can’t help myself, I believe my God to be an extreme God! I believe He is a God who wants to manifest Himself to His children in an intimate and glorious relationship. We left behind our home, church, income, friends and a lifestyle in the Dallas area we had flourished in for many years. Upon arriving and inspecting this house, we found it to be in shambles from years of neglect, we could do nothing but cry and feel sorry for ourselves. We sometimes think of the first night we spent in the house, it had 7 window panes broken out, un-level floors, and a bathroom that we hated to use. As we sat there in a small upstairs bedroom on a Saturday night, we couldn’t help but stare at the pitiful condition of the room. The people who had rented the house before us bought it had allowed their kids to paint the room in an awful green and blue. We were sitting side by side in two lawn chairs, with our feet propped up on a milk crate and a 5 gallon bucket, staring at the wall. We couldn’t help but think of what we had left back in Egypt. We had all but fallen off the edge of the earth, only our pastors, and family had a clue what we were going through. I knew then, in order to survive in the wilderness, we would have to go to extreme levels of faith. In my quiet time one morning, Holy Spirit showed me that when Abraham left the familiar land to go fulfill God’s plan, he must first dig a well in each new place he journeyed. Abraham understood that without a reliable source of water, it would be impossible to survive in the harsh land. (Gen. 21:30). In desperation, I pressed into God and imagined as I prayed to Him that I was digging a well each time I prayed in my secret place. Day after day I would visualize digging a well with every confession and profession of faith. One morning, in November of 2003, when I walked down the stairs, I walked into the tangible presence of God. It filled the lower story of our one-hundred year old house. I called to my wife Jae, who was still upstairs, and said, “You had better get down here; the presence of God has filled this place!” She came down and joined me in the living room and we just set there in the heavenly presence of God, soaking in this glorious manifestation. I had felt this presence before on several occasions, but this time it was in our home, from our feet to above our heads, over flowing, flooding our entire being was His glorious presence. This holy manifestation remained for an hour or more and then it lifted. I sat down in my “quiet time” chair and suddenly I felt an intense, powerful sword, slowly being pushed down into me, from the top of my head down into my abdomen. As it moved downward through my body I could feel every centimeter of its travel. My body shook as I was compressed under this extreme, penetrating power of God, I could do nothing but surrender to what God was doing in me. I can’t tell you how long this manifestation lasted but when my wife, Jae came downstairs from her quiet time that morning, the anointing rested upon me and it still lingered in the room. When I laid my left hand on her forehead, she could feel the anointing flow over her head as well. Truly, I had just experienced a divine encounter at the well. In Genesis, chapter 24, Rebekah’s destiny was at the well, she had gone there many times but on this particular day, her life changed forever for she was about to meet her Isaac. In John 4: 6-7 “Now, Jacob’s well was there. Jesus therefore, being wearied with [his] journey, sat thus on the well: [and] it was about the sixth hour. 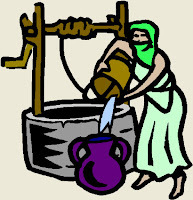 There cometh a woman of Samaria to draw water: Jesus saith unto her, Give me to drink.” The Samaritan woman’s life was about to change forever. God doesn’t manifest Himself to us just to give us a thrill but to change us eternally. The effects of our change can impact our family, our city, our region and our nation. How many divine encounters have we missed due to our busy undisciplined lives in which we don’t come to the well or when we do come, we don’t allow time to sit and wait for Him at His well? God will meet you at the well. Come to His well and come often for you never know which day He will be waiting for you there. Come, Come to His well!